Nucleolus, also called little nucleus, was first observed by Fontana in the skin cells of an eel. Term 'Nucleolus' was coined by Bowman. It is the factory where extreme protein synthesizing nano machines ‘ ribosome’ are synthesized and assembled. The two sub units of this machine, 40S and 60S sub units are separately assembled in the nucleolus and dispatched into the cytoplasm where final assemblage into complete ribosome occurs. Nucleolus are membrane less prominent spherical colloidal bodies present in the nucleus. The size of the nucleolus is dependent on the metabolic activity of the cell. Large sized nucleolus is present in cells with high synthetic activity. The number of the nucleoli depends on the species and the number of chromosomes. Generally, a diploid cell is with two nucleoli but there are five nucleoli in somatic cell of man and about 1600 nucleoli in the oocytes of Xenopus. What are nucleolar organizing regions (NORs)? NOR are certain secondary constrictions that contain genes coding for 18S, 5.8S and 28S rRNAs and induce the formation of nucleoli. This area is lightly stained and is constant for a given chromososme. In man, nucleolar organizers are located in the secondary constrictions of chromosomes 13, 14, 15, 20 and 22. Nucleolus, what is it chemically? 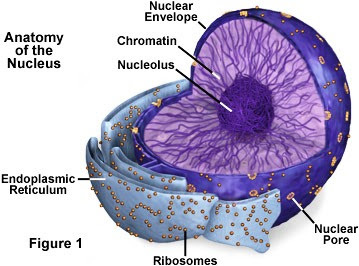 Nucleolus is a membrane less structure where the intact organization is maintained by calcium ions. It contains DNA of NOR, all rRNAs, RNA splicing proteins, RNA binding protein (nucleolin), many enzymes and Ca2+ ions. What are the functions of nucleolus? It is the site of ribosomal subunit synthesis (40S and 60S). The formation of ribosomes by joining ribosomal proteins with r-RNA takes place in the nucleolus. It plays an important role in spindle formation during cell division.